5.5"H in. x 3.25"L in. x 1 5/8"W in. 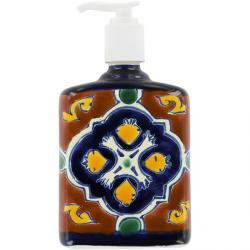 These talavera ceramic soap or lotion pumps are the perfect complement for your existing talavera sink. Or to completment your Mexican tile in your bathroom countertop or in your kitchen back splash. Rich vivid colors make this is a sturdy piece of art that can be used to delight your friends and family. Each soap dish is hand painted. It includes white plastic pump. Our skillfull artisans create these items by hand with great agility. Handmade pieces are often of higher quality and individually unique. Because of its handmade quality, the item you receive may vary slightly from the photograph. After all the beauty of talavera lie on that not two pieces are never the same. 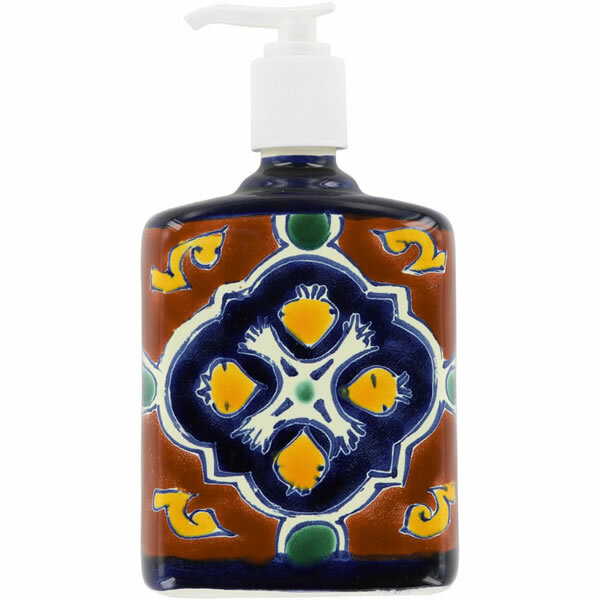 Each of our Mexican talavera Soap or Lotion Dispenser is unique and handcrafted. The hand made nature gives it a warm and rustic finish. The Soap or Lotion Dispenser is glazed and decorated by hand, and fired once again to give it its final and lively finish. Its physical characteristics make Mexican Ceramic Soap Dispensers particularly attractive and distinctive. Size: 5.5"H in. x 3.25"L in. x 1 5/8"W in.